We supply roller shutters, sectional doors, rapid roll doors, steel security doors or UPVC curtains in and around Liverpool, St Helens, Warrington or Blackpool. We also manufacture and install, so whatever your requirements we can help. And we will beat any written comparable quotation. Just give us a call on the numbers to your left. 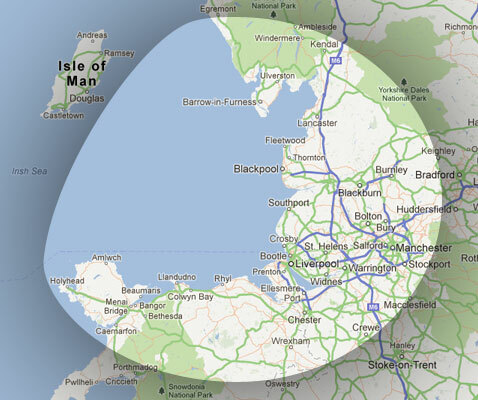 We operate in and around Liverpool, St Helens, Warrington & Blackpool. Need to send us a letter? Our Postal & Registered Address is at The Hatchery, Wash Farm, Rainford Road, Bickerstaffe L39 0HF. Use the form below to send us an email enquiry and we will get back to you. Your privacy is important to us and any information you provide will only be used to deal with your request. We are able to manufacture, supply and install industrial & domestic roller shutters & security doors across The North West. Here at Roller Shutter Sales we manufacture, supply & install Industrial & Domestic Roller Shutters & Security Doors throughout The North West.